VIRGIN – After an extensive investigation into a man who has been on the run from the law for his alleged involvement in a home invasion robbery and assault in Salt Lake City, along with warrants issued for his arrest, the man and his girlfriend were apprehended Monday afternoon in the town of Virgin following a high-speed pursuit and a foot chase. 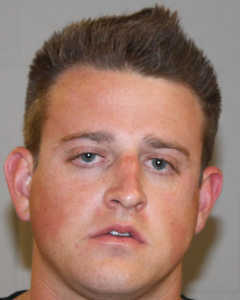 The Washington County Drug Task Force arrested Jordan Matthew Lucia in St. George a few years ago on drug related charges, said St. George Police Sgt. Johnny Heppler, who supervises the gang unit. Lucia was convicted on felony drug distribution charges in June 2010 and August 2013, according to Utah court documents, and served time in federal prison. Heppler said Lucia began dealing drugs in the St. George area again after his release from prison. In October 2014, during a narcotics distribution investigation into Lucia, the task force conducted a controlled buy of heroin through the use of a confidential informant who purchased heroin from Lucia, according to Utah court documents. In January 2015, a warrant was issued for Lucia’s arrest for the first-degree felony drug distribution charge. On Feb. 5, the task force executed a search warrant on a St. George motel room registered to 24-year-old Jamie Richel Pullman, whom detectives observed entering and exiting the room. During a search of the room, a distributable amount of heroin, cocaine and a methamphetamine pipe were located. Detectives also located an Idaho ID with Pullman’s photo on it but with a different name listed. Heppler said the urgency in arresting Lucia and Pullman escalated because of their alleged involvement in a violent home invasion robbery on Feb. 22 in a home located at 1463 South Richards Street in Salt Lake City. And then, just last week, in the Orem area, officers were set up in place to try to apprehend him and he led officers on a high-speed chase up there. It was very dangerous. He was going into oncoming traffic and things like that and so they terminated the pursuit because it was getting pretty dangerous. And he’s been on the run ever since. The Washington County Fraudulent Identity and Security Threats Unit, known as the FIST unit, made up of representatives from local and federal law enforcement agencies, including U.S. Marshals, Washington County sheriff’s deputies and St. George Police detectives, the county attorney and a prosecuting attorney, uncovered that Lucia and Pullman were possibly in the St. George area Sunday. Heppler said the opportunity didn’t present itself to safely take Lucia into custody Sunday night. On Monday, at approximately 4:29 p.m., a LaVerkin City Police Officer responded to an attempt to locate broadcast incident at the Hurricane Family Dollar discount store regarding a suspicious woman possibly in possession of counterfeit bills, the Washington County Sheriff’s Office said in a news statement issued Monday night. As the woman left the area, the witness was able to describe her vehicle to police, the statement said. Dispatch was able to determine the vehicle was listed stolen by the Unified Police Department in Salt Lake City. The police officer located the vehicle around 4:42 p.m. in the parking lot of a grocery store and attempted to initiate a traffic stop, when the vehicle fled the area. The officer initiated a pursuit of the vehicle as it headed northbound on state Route 17 toward Toquerville, according to the statement. The vehicle was driving in excess of 90 mph entering the residential area. “Due to the safety concerns for the public, the pursuit was terminated by the pursuing officer,” the Sherriff’s Office said. At 4:52 p.m., a Utah Highway Patrol trooper spotted the vehicle headed southbound on state Route 17 toward LaVerkin again. A sergeant with the Washington County Sheriff’s Office observed the vehicle exiting the Maverik gas station located at the intersection of state Route 9 and 500 North. As the vehicle headed east on SR-9 towards Springdale, the LaVerkin officer made a second attempt to stop the vehicle, according to the statement. The vehicle again, fled eastbound on SR-9. Due to weather conditions and traffic, the pursuit was again terminated just prior to the town of Virgin. The off-duty Zion Canyon Police Chief observed the vehicle park near The Church of Jesus Christ of Latter-day Saints in Virgin and the occupant flee the area on foot, the statement said. Officers with the Washington County Sheriff’s Office, LaVerkin Police and Zion Canyon Police Department responded to the area. 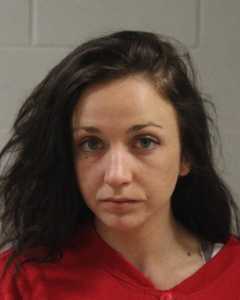 Lucia was later located, hiding in a vehicle on a citizen’s property and taken into custody without further incident just before 5:30 p.m.
Pullman was also located after the high-speed chase around 6 p.m. and was arrested for the Feb. 5 drug-related charges. Both Lucia and Pullman were booked into the Washington County Purgatory Correctional Facility. While conducting a strip search of Pullman at the correctional facility, three counterfeit $50 bills were located on her person. Pullman was charged with one first-degree felony for drug possession with the intent to distribute; two second-degree felonies for possession of drugs and a falsified identifying document; one third-degree felony for forgery; and one class B misdemeanor for drug paraphernalia possession. Dang tweekers/junkies. I’m glad they are off the streets. Both sound like nut cases.